How to Easily Master Format SAMSUNG GALAXY TAB 4 7.0 (SM-T230/SM-T231/SM-T235) with Safety Hard Reset? Solutions and tips for fix problems at SAMSUNG GALAXY TAB 4 7.0 (SM-T230/SM-T231/SM-T235). Samsung Galaxy Tab 4 7.0 is the tablet with Android operating system using 7 inches LCD screen. Basically there are three options that we can choose for GTab 4 7.0. There are SM-T230 is Samsung Galaxy Tab 4 7.0 without Internet or GSM slot, we can use all features except GSM call and Internet connection, we have to use Wifi to access Internet. The other one is SM-T231 which have GSM 3G Internet data network, and the other one is SM-T235 with GSM 3G and LTE at this Samsung Galaxy Tab 4 7.0 family. How to Fix or Problem Solving for Recovery SAMSUNG GALAXY TAB 4 7.0 (SM-T230/SM-T231/SM-T235) hang or not responding or malfunctions or stuck or freezing or bricked ? With 7 inches LCD screen at SAMSUNG GALAXY TAB 4 7.0 (SM-T230/SM-T231/SM-T235), we can play games or watch movie or doing office work more easily and fun. There are many applications that we can add more at our tablet from Google Play Store. There are many of them which is free to download and some of them need to be purchase. However, we should understand that some applications from Google Play Store are not compatible with our SAMSUNG GALAXY TAB 4 7.0 (SM-T230/SM-T231/SM-T235), some of them also have malware or can make our tablet become hang or stuck or bricks or broken or frozen or boot loop or hang or LCD touch screen not responding. At this time we should try to do force soft reset or force reboot or restart to delete some temporary files or caches files from internal memory. If the problem still happen, then we should have to do hard reset or master format. How to Force Soft Reset or Reboot or Restart SAMSUNG GALAXY TAB 4 7.0 (SM-T230/SM-T231/SM-T235) ? If our tablet get trouble like hang or freeze or LCD touch screen not responding then we should force soft reset or force restart SAMSUNG GALAXY TAB 4 7.0 (SM-T230/SM-T231/SM-T235) using press and hold POWER Button several second until the phone turn off and restart by itself. If the tablet still response with our finger touch, then we can do soft reset or reboot by press and hold POWER Button for several seconds until pop-up menu appear, then choose Reboot / Restart the tablet. This process is save to do anytime, because our data will not removed or still available at SAMSUNG GALAXY TAB 4 7.0 (SM-T230/SM-T231/SM-T235), only some temporary files or caches will be remove when doing soft reset or reboot. The SAMSUNG GALAXY TAB 4 7.0 (SM-T230/SM-T231/SM-T235) will doing the process of restoring to factory default. How to Restore and Reinstall Clean Android Operating system / firmware at SAMSUNG GALAXY TAB 4 7.0 (SM-T230/SM-T231/SM-T235) ? After using and download many applications from Google Play Store, sometime the installed applications can make the operating system or firmware become corrupt. There are many possible sign such as not responsive or can not boot normally. At this situations, we should have to reinstall clean factory default Android operating system at our SAMSUNG GALAXY TAB 4 7.0 (SM-T230/SM-T231/SM-T235). We have to know, that the factory default Android Kitkat operating system file source already saved inside our SAMSUNG GALAXY TAB 4 7.0 (SM-T230/SM-T231/SM-T235) ROM or Internal memory, so we does not have to connect our tablet to any gadget or device when we want to reinstall the OS. Just follow the hard reset steps above, then the clean factory default SAMSUNG GALAXY TAB 4 7.0 (SM-T230/SM-T231/SM-T235) Android operating system or firmware will reinstall automatically. Please remember to always backup all important data before doing hard reset or reinstall the operating system, because all important data and installed applications will be removed or wipe from this tablet. How to Unlock or Fix or Bypass or Solutions for SAMSUNG GALAXY TAB 4 7.0 (SM-T230/SM-T231/SM-T235) forgot password code or security lock screen pattern or pin (lost password)? We are very recommended to protect our tablet for give more security protections when the tablet away from us. Usually after use several time, we will have many pictures or data which maybe confidential. We can choose several options to protect, but usually we are recommended to use screen lock pattern protection for faster access. Some user also like to use Password Pin or other options that available at SAMSUNG GALAXY TAB 4 7.0 (SM-T230/SM-T231/SM-T235). The problem happen when we are forget the answer for security screen lock pattern or password pin protection at our tablet. But we still can try to bypass or unlock screen lock protection using Google account or Gmail username and password. Please try to give several time wrong answer continuously until the tablet locked or freeze for several seconds. At this moment we will find Forgot Password / Pattern button to help us bypass or unlock forgotten security protection using Gmail account that we have already sign-in at the first time we use this tablet. If we can not access Gmail account, then we should have to do hard reset or master format above. How to Improve Performance SAMSUNG GALAXY TAB 4 7.0 (SM-T230/SM-T231/SM-T235) to make run more faster? Basically the specifications at SAMSUNG GALAXY TAB 4 7.0 (SM-T230/SM-T231/SM-T235) already fast to run many applications, with 1.5GB RAM we can have many multitasking application running together. But we have to know that our tablet still have limitation, if we use so many applications especially which run in the background, then maybe our tablet will become slowly. As we know, some applications that we installed from Google Play Store will keep run in the background to wait some command or internet data access. All application will consume RAM and processor resources, if there are many applications, then more RAM and process should use by them, and make our SAMSUNG GALAXY TAB 4 7.0 (SM-T230/SM-T231/SM-T235) become slowly. Therefore we can try to reduce installed applications and choose only important one. Since we can easily install it again later, then choose what we should install wisely. If we want to make our SAMSUNG GALAXY TAB 4 7.0 (SM-T230/SM-T231/SM-T235) performance faster again like new, then we have to do hard reset or master format. Is That Any Secret Code for Doing Format SAMSUNG GALAXY TAB 4 7.0 (SM-T230/SM-T231/SM-T235) ? This is only available for specific type and have dialer phone pad. We can try to use secret code for doing hard reset SAMSUNG GALAXY TAB 4 7.0 (SM-T230/SM-T231/SM-T235) is *2767*3855#. But please remember to always be careful typing that code, because the SAMSUNG GALAXY TAB 4 7.0 (SM-T230/SM-T231/SM-T235) will doing hard reset and remove all data and installed applications. [Q] Hi, I have purchased samsung tab T 231 Recently, screen is getting struck. Please give me the solution. [A] Hi, we suggest to hard reset your Samsung Galaxy Tab 4 T231 using hardware button combination key like steps at #option 2 above, it will reformat the operating system to factory default. [Q] Hi, I have a problem with my SM-T231, it keeps going on a reboot spree. I really don't know what to do. Reply ASAP. Thank you. 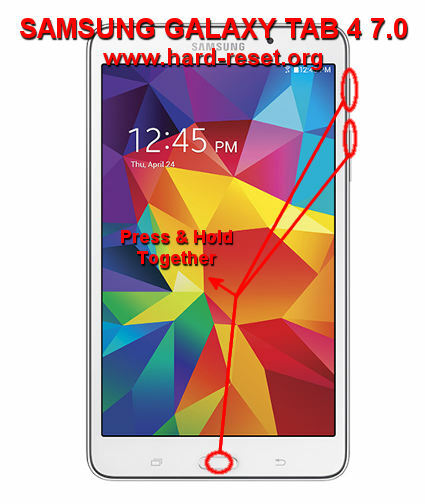 [A] Hi, please try to do hard reset your Samsung Galaxy Tab 4 using hardware button combination key like steps at #option 2 above. That process will reinstall your Samsung Galaxy Tab 4 7.0 operating system to factory default. The information from this page describe about hard reset not working on galaxy tab 4. If you need another resource for hard reset, use search function at this homepage or find from our related posts. How to Easily Master Format OPPO A5 with Safety Hard Reset? How to Easily Master Format XIAOMI REDMI PRO with Safety Hard Reset? Hello.i have a sumsung tab4 dat fell on the the ground some days back and ots screen brole inside so nothing appears on the screen now.i want to format it or reset what do i do ? Hi, it seems that your Samsung Galaxy Tab 4 LCD are broken. You should replace with new LCD screen, but we recommended to bring at Samsung authorize service center because they will have original LCD screen and trained person to replace with correct steps. Hi , I forgot my password to unlock screen. I tried the way to reset it by using gmail passwword as u said, but i am not getting any option saying to reset the password. Hi, at normal situations, after doing not more then 10 times wrong answer continuously, your Samsung Galaxy Tab 4 will locked or freeze and show Forgot Password / Pattern button. Please try to do this again carefully. This process only work for standard factory default screen lock protections. If you download other 3th party protections, maybe the steps to recovery will different. Hi, first you can charge your tablet and make sure the battery not empty, full is recommended. Then please do hard reset your Samsung Galaxy Tab 4 7 inches using hardware button combination key carefully. If your tablet still not work, then maybe it get hardware bricks and need to get repair at Samsung authorize service center. Hi, actually you can not remove or replace or change Samsung Galaxy Tab 4 inches battery easily, because this table battery is non removable. You should use special tools with some tricks to open the back cover case without damage that case. However, if you need to replace the battery, then better you bring to Samsung authorize service center. Hi, better you try to backup all important data at your Samsung Galaxy Tab 4 7.0, then do reformat with software menu, because your phone still can reboot properly. Mostly this problems comes because applications trouble or too many applications inside your Samsung Galaxy Tab. Hi, if you mean your Samsung Galaxy Tab 4 7 inches locked using screen lock password, then you have to unlock to restore using Gmail account. Please try to give several time wrong answer continuously until your tablet locked, then find Forgot Password button, you can give your Gmail username and password to restore the forgotten password. However, if your locked tablet can not bypass or restore, then you have to do hard reset or master format using hardware button combination key. Hi, your new Samsung Galaxy Tab 4 need to get fully charge when the first time use. Please do not charge from computer because not all USB port have proper current which need at your Samsung Galaxy Tab 4. Please use factory default Samsung Galaxy Tab 4 power charger adapter. Hi, please try to do hard reset using software menu or hardware button combination key will be the same result to reformat your Samsung Galaxy Tab 4 with factory default operating system file source and make all installed applications and setting back to beginning. If you have done hard reset your Samsung Galaxy Tab 4 but wifi problems and bluetooth trouble still happen, maybe your hardware need to get repair, please bring your table to Samsung authorize service center. Hi my Samsung SM-T230 Won’t charge, I haven’t used it in a while so the battery went dead and I haven’t charged it, but now it won’t charge please can you help? Hi, if your Samsung Galaxy Tab 4 7″ battery already corrupt, then you need to replace that battery first before you can use it again. But first you can try to charge again and wait about 1 hour or more, because sometime the very empty battery can make charger seems not work, but after about 1 hour, if the battery still work, then it will show charging sign and wait until it finish. If it not work after waiting 1 hour or more, then maybe your battery already damage and need to get replace at Samsung authorize service center. Hi, mostly this problems because applications trouble like battery saver or something like that. Please find suspected apps then uninstall that applications. However, if you still can not find that applications, then we suggest you to backup all important data at your Samsung Galaxy Tab 4 7″ either to microSD external card or cloud backup, then do hard reset your tablet to reformat and make all setting back to factory default. Hi, maybe you or someone else ever change the acceptability, therefore you have to remove or disable that features at your Samsung Galaxy Tab 4 menu Setting > Accessibility and turn off TalkBack or any other options to make your phone work normally again. I live in turkey..st 235 is not available in the market. I need a phone tablet set, I heard that there is a software thing can be installed to 231/232..so it becomes a mobile phone..is it correct and safe? Hi, sorry we do not have any information about product code of Samsung Galaxy Tab 4 7 inches at some country market. Maybe anyone else can give more information about your question. Hi, first you can try to use different Samsung Galaxy Tab charger which have minimum 2 A current output, wait about 1 hour then it shoud give some battery capacity although not full. If still not work, then maybe your Samsung Galaxy Tab 4 battery is corrupt or other hardware trouble, you have to do bring your tablet to Samsung authorize service center for further check. I would like to downgrade sm-t230nu to factory state. what can be done. Hi, if your tablet still can boot properly, then you can do reformat to factory default using menu setting like steps at #option 1. However, if your Samsung Galaxy Tab 4 7″ can not boot normally, then you have to do hard reset using hardware button combination key like steps at #option 2 above. My tablet is doing a automatic turn off, it switching off itself when I didn’ t use it, what will I do? Hi, perhaps there are some applications crash that make operating system of your Samsung Galaxy Tab 4 7.0 become damage and make it turn off by itself. Then first you need to try doing hard reset to reformat or reinstall the operating systems to factory default. If after doing hard reset, the problems still happen, then we are suspected to the battery damage, then please consult with Samsung authorize service center. Hi, have you ever install custom rom? Maybe that can make your Samsung Galaxy Tab 4 7.0 can contain malware or viruses that install some other applications or ads without your permission. Please try to do hard reset and see whether that automatic installation happen or not. If you are not sure about this problems, please bring your Samsung Galaxy Tab 4 7.0 to Samsung authorize service center, they can help you to reinstall with factory default operating system. Hi, maybe that sound comes from latest installed applications. Please find that apps and do uninstall that trouble maker applications. If you still can not find that, then please consider to do hard reset either using menu setting or hardware button combination key. But please do not forget to backup all important data. Hi, I have a problem with my SM-T231, it keeps going on a reboot spree. I really don’t know what to do. Reply ASAP. Thank you. Hi, please try to do hard reset your Samsung Galaxy Tab 4 using hardware button combination key like steps at #option 2 above. That process will reinstall your Samsung Galaxy Tab 4 7.0 operating system to factory default. Hi, I have purchased samsung tab T 231 Recently, screen is getting struck. Please give me the solution. Hi, we suggest to hard reset your Samsung Galaxy Tab 4 T231 using hardware button combination key like steps at #option 2 above, it will reformat the operating system to factory default.